Fine art portraits are an heirloom. An investment now will allow you not only to relive the moments that highlight your life, but to share them with future generations. Portrait sessions are priced at $250. This includes a session up to 1.5 hours, artistic retouching and editing, an online proofing gallery, and all of your high-resolution images delivered to you on a custom USB drive. My husband and I were engaged under the century tree in 2006. My father provided photos, and they are absolutely priceless to us. As a way to give back to the next generation of the 12th Man, I offer 30 minutes of coverage for Century Tree Proposals for $112. WHOOP! 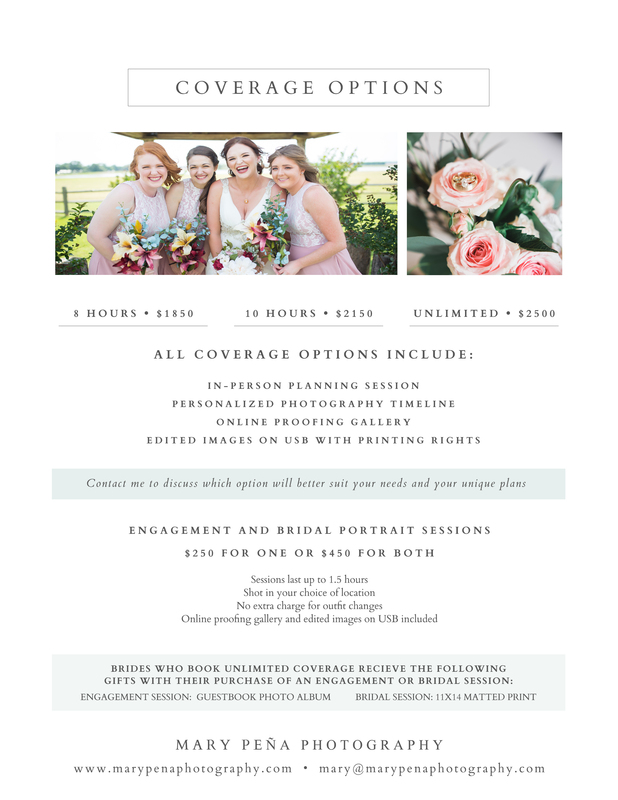 Wedding day coverage begins at $1,850. For all of the details regarding coverage options, click here to download my pricing guide. I am not currently booking for family, maternity or senior sessions. If you would like to talk to me about a booking, click the button below.